Masked man dressed up for Halloween. Pic © Chloe Smith JMU Journalism. Halloween is always a spooky time of year and for one Wirral pub it was an all-nighter event full of music, alcohol and costumes at the weekend. 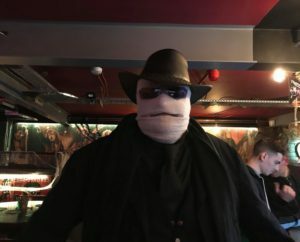 Molly’s Chambers bar and kitchen in Birkenhead launched its first Halloween-themed party called ‘A Nightmare on Bridge Street’ after re-opening in the summer. The venue, which was previously known as The Hotel California, and was renowned for its similar parties. There are more Halloween events on Merseyside this week. A Halloween party at the Coffee House in Liverpool, starting at 6pm. The night will feature face-painting and a DJ and entertainer playing fun party games. For adults, there is an event called ‘Found’, which is Haunted circus and will be held from 10pm-4am at the Liverpool Arts Club. You can expect a venue transformation listening to house, R&B and tech music. For children and families, throughout the week up until November 4th at Church Farm they are running the family fright festival where you can go pumpkin picking, take train rides, watch puppet shows and see the animals. Another event for all the family to enjoy is The Crocky Horror Show at The Crocky Trail in Chester. The doors open at 6.30pm and it will run from the October 26th to 31st. It includes haunted trees, the wall of death, zombies, Crocky dungeon and a spooky trail.